For 30 years, Tele Vue has pushed the boundaries of APO refractors, as well as eyepieces, to the recognized pinnacle of performance. 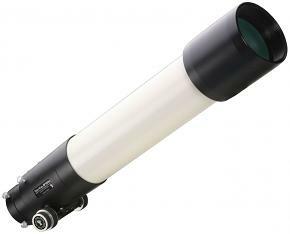 We were gratified but not surprised that Backyard Astronomer's Guide said of the NP101: "optics don't get any better than this." 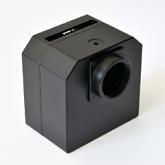 No wonder Sky and Telescope rated the NP101 tops and selected it as the test instrument for its landmark review of the SBIG STL11000 CCD camera . 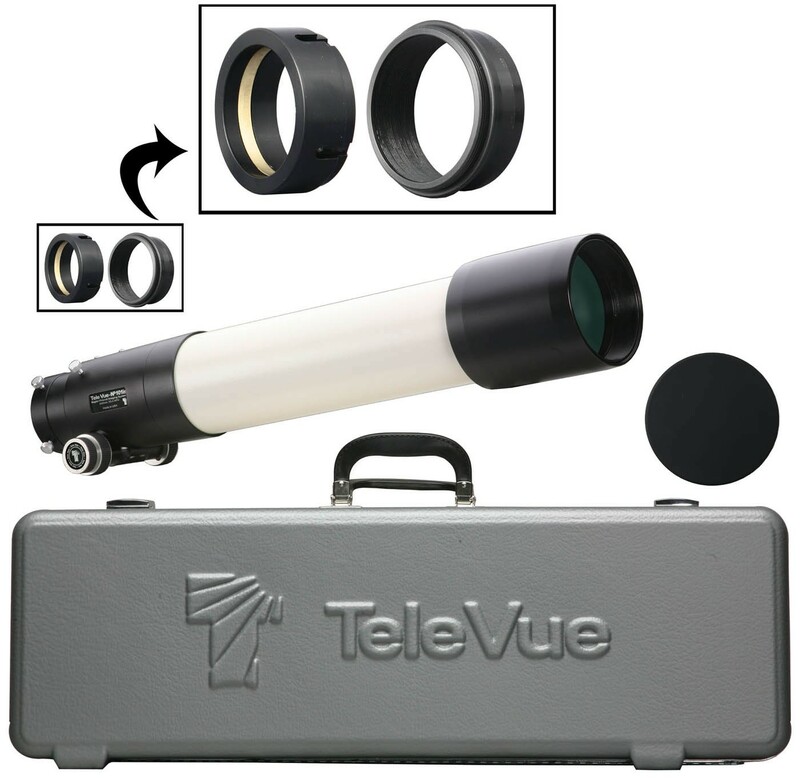 The "is" versions of the Tele Vue-60, NP101, and NP127 retain the exemplary wide field and planetary visual capability while adding new features to make imaging easier and more flexible. We were determined to make the NP series optically, mechanically, and functionally as perfect as possible for imaging up to 50mm diagonal chips without penalty to its near ideal visual operation. (Reviewer Note.) How? 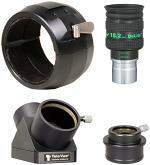 By applying the developments created for the Tele Vue-60is to the new NP101is and NP127is and then going beyond. Imaging System scope with DSLR camera on Vixen Sphinx mount. Accessories shown include Focusmate Driver and Digital Indicator Kit. The NP101 (540mm, f/5.4, 4") and NP127 (660mm, f/5.2, 5") maintain their optical specifications yet with redesigned 4-element optical systems. Larger rear lens groups absolutely minimize vignetting in formats up to 50mm diagonal. For these large chips an optional field corrector was developed (Reviewer Note.) so the corners of the newly brightened edges would virtually be as perfect as the center of the field. 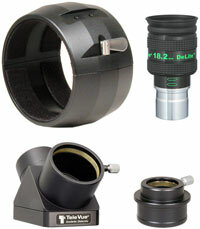 Next, to take full advantage of the larger lenses, we developed a larger focuser and draw tube having a 3" front aperture and 2.4" rear aperture. 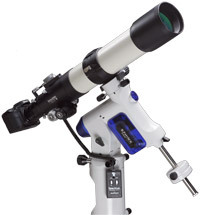 This eliminates any restriction of the larger diameter converging light cone. We build and test the rack and pinion focuser to hold 12 lbs. of weight, yet still permit extremely fine focusing control via a 10:1 dual speed pinion assembly. This new draw tube also permits quick change from visual to imaging operation and allows full camera rotation without focus change. In addition, it has the capability to correct for any residual focal plane tilt and accepts a "position stop" for our digital micrometer to allow repeatable focus measurement to 0.0001". The Focusmate 10:1 planetary ball type reduction focuser provides extremely sensitive focus adjustment, measurable with the optional Digital Micrometer Kit to better than 1/10,000". Also, the optional Focusmate Driver permits electronic motor control of the focusing process. The Focusmate Driver has direction push-buttons and adjustable speed. A tap on the button permits vibration-free focusing in steps as small as approximately 0.0005". Imaging insert threaded for Imaging System components. NP101/NP101is Hard Case Features and Specs.